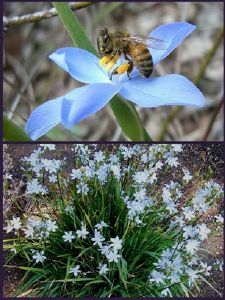 Orthrosanthus laxus or Morning Iris has incredibly lovely pale Wedgwood blue star like flowers appearing above thin blue-green iris-like leaves. Here in Hampshire this plant has proved hardy, despite being native to Australia. Grow in moderately fertile, well-drained, humus-rich and moist soil in full sun. Shelter may be required in colder more exposed locations.